To walk a ladder, you can either buy a lead and exercise it twice a day, or you can learn to balance on it and do the walking bit yourself! The walking ladder is an extra wide ladder which you can balance on, and then learn to walk along the ground moving the feet of the ladder (one step at a time)! You can also balance on the top rung (one leg at each side of the ladder) and start juggling while walking along with the ladder. Walking ladders are relatively easy to master compared to some other balance props, however if you fall from the top of a walking ladder it will hurt. For this reason please consider finding a juggling club where you can practice with some expert help, and I would advise you to buy a helmet and some elbow and knee pads! 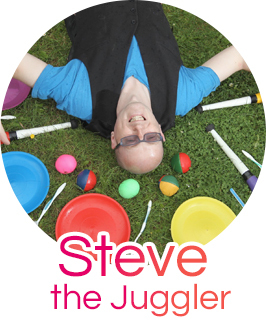 Contact me if you would like to know where your nearest juggling club is! Start with the ladder leaning against a wall. Put both feet onto the bottom rung. Put your feet tight against the sides of the ladder (the uprights). Your hands should be on the sides of the ladder (not holding onto a rung)! Practice lifting the top of the ladder away from the wall, and holding the ladder for as long as you can. This will help you develop your balance and just keep practicing until you feel happy enough that you can stay upright without wobbling unintentionally all over the place! Now try rocking the ladder side to side gently, lifting the foot of the ladder off the floor each time. Try taking some tiny steps away from the wall and then back towards the wall. You will soon notice that it is easier to keep moving on the stilts, than to try and stay still. This is another thing in common with stiltwalking! Ease the ladder off the wall so it is upright, and attempt to stay on it. If you fall, then you are close to the ground, and if you fall forwards (the most common way to fall), you will hit the wall and come to a safe stop. If you let go of the ladder when you are falling, make sure that you get clear of it before it comes crashing to the ground! Balancing Ladders are very noisy when they hit the ground, but nothing like the noise you will make if it comes crashing down on you! With the ladder hitting the wall if you fall forwards, this also means that there is less chance of trapping your fingers under the ladder. When you are comfortable with taking small backwards and forward steps on the ladder, then try going forward for as long as you can. If the ladder is falling, then let it go. You are more important than the ladder, and you would have to do a lot to damage this prop! Practice falling to the side of the ladder, and also with one leg through the rungs and one leg to the side of the ladder. I cannot emphasise enough the importance of practicing falling properly! You will find that you have much more stability on the second rung than on the bottom! This basically means that you can lean further to each side to make corrections without toppling over. Repeat all of the tips given above for learning to balance on each rung! Take your time, and make sure you feel confident balancing and walking on each rung before moving up to the next rung. Running up and down the ladder (freemounting) Just needs practice. 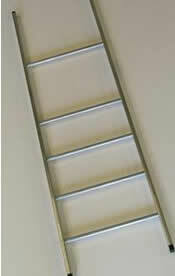 Be careful not to put your foot through the ladder, as you may hurt yourself in a certain private place! Take your time and just try running up and down the first few rungs until that feels safe, then extend your run by an extra rung until it feels safe! Leg Over when you reach the top of the ladder, try putting your leg over the top rung, so you have a leg on each side of the ladder. This is quite a dangerous move compared to what you have learned so far, so be very careful. Juggling If you can do the legover trick (above), then you will not need to use your hands to hold the ladder. This means that you can use your hands for other purposes such as juggling, plate spinning etc. The possibilities are endless! If you have a friend on a walking ladder also, then why not try some club passing! 360 degree turn just lifting up one leg of the ladder, do lots of tiny little steps round in a circle, until you return to your starting position! You could also do a 180 degree turn once you have walked to one side of the hall so that you can then walk back again! Audience Participation You can get members of the audience to hold your ladder vertically while you take a long run up to it and climb into position, then on an agreed signal, they can release the ladder. This kind of routine could have as much as 20mins build up! Balancing Ladder Walk of Death Try walking the ladder over some objects such as your favourite teddy bear, or perhaps even a willing volunteer (make sure you practice many many times before you ever pick a live volunteer to do this trick with)!